From the creator of Lend Me A Tenor comes this whodunit filled with twists, turns and murderous pandemonium. It is December 1936 and Broadway star William Gillette, admired the world over for his portrayal of the lengendary Sherlock Holmes, has invited his fellow cast members to his lavish Connecticut castle for a holiday weekend of revelry. When one of the guests is stabbed to death, the festivities in the isolated house quickly turn dangerous. It is up to Gillette who assumes the persona of his beloved Holmes, to track down the killer bfore the next victim appears in this witty, suspenseful caper. "...But in theatrical practice, it doesn't work well, because it feels like it takes 20 minutes for the actors to walk around its circumference or traverse its diameter. To put that another way, the game can't really get afoot until people get from one place or another, and you can't have the gag, or the plot twist, hanging in the air all that time." 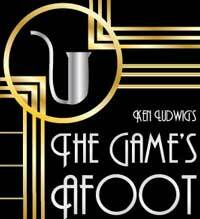 "...The truth is, everyone on stage in the Drury Lane Theatre production of "The Game's Afoot," Ken Ludwig's deliciously nutty, sensationally well-done mock-murder-mystery about the New York theatrical set, circa 1936, is in full "actor" mode. And it hardly matters whether they happen to be biting into a carrot, or wrapping a garrote around the neck of a wife, or delivering zesty infusions of Shakespeare, or sending up Sherlock Holmes in ways that should give that guy named Benedict Cumberbatch (of recent "Sherlock" fame) a moment of pause." "...Ken Ludwig's comedy thriller premiered in 2011, but like his hits Lend Me a Tenor and Crazy for You, it's designed to feel a lot older. Set in 1933 in the palatial home of real-life Broadway star William Gillette (the original Sherlock Holmes), the play is tailor-made for theater-history buffs; others may find it hard to stay interested given Ludwig's timidly conventional characters and predictable plot twists." "...Drury Lane has obviously selected a bit of fluff for their audiences whom they know very well. I am sure The Game's Afoot will do well for their box office as it does not offer any lessons, morals or new ways of thinking; it is purely for amusements sake. However much of the opening night audience laughed hysterically and loud which means they enjoyed it much more than I. After all I am only a critic with a certain perspective. As Martha Gillette says when discussing why the theatre critic Daria Chase was murdered "Of course she was murdered! After all she was a theatre critic!"" "...The Game�s Afoot inevitably welters in witless and obvious trash talk from cartoon crime characters; grungy, burlesque-quality sight gags; and a litany of ill-fitting comedy and horror clich�s that create clashing styles and schizoid mood changes. You won�t laugh till you don�t scream." "...The wacky events with ample Shakespearean quotes and madcap movements is both a comedy treat and a fine mystery. Ken Ludwig tries hard to blend the two styles and he takes a tad too long to ties up lose ends but we laugh and enjoy the journey especially by such a terrific cast lead by Hasenstab and Robertson. Purest of the mystery or farce genre may be offended by Ludwig�s smart plotting and nimble characterizations carries the day. Why not have a few laughs while being scared? It�s all in good fun." "...Despite a slower than expected start to Drury Lane Theatre's " The Games Afoot", opening night audience members found themselves laughing hysterically. This is a Ken Ludwig play (remember,"Lend Me A Tenor") and while the into takes a little longer than normal, once the comedic writing takes hold, the belly laughs just keep rolling. Directed by William Osetek, who understands how important timing is in a farce, on a cleverly designed set by Kevin Depinet, this 1936 murder mystery has all the ingredients of a Sherlock Holmes thriller." "...Although not one of Ken Ludwig�s best plays, this production is pleasantly amusing and often extremely funny as it blends mirth with murder and mayhem. Employing the talents of eight area comic actors, William Osetek has staged a perky, lighthearted diversion that offers theatergoers the perfect end-of-the-summer entertainment." "...�The Game�s Afoot� is a throwback to the mystery dramas that were so popular on the English and American stages from the early 1900�s through the late 1970�s. They have pretty much disappeared in the last generation, except for satires and spoofs and the occasional musical. Ludwig�s play isn�t at the level of a �Dial M for Murder� or �Sleuth� or even �The Mousetrap,� but it�s a good audience show and the acting and production values at Drury Lane are first rate. Even with its defects it should draw large and appreciative patrons who hunger for this kind of entertainment, which means most of us."